Augustin-Louis Cauchy around 1840./ Lithography of Zéphirin Belliard after a painting by Jean Roller. 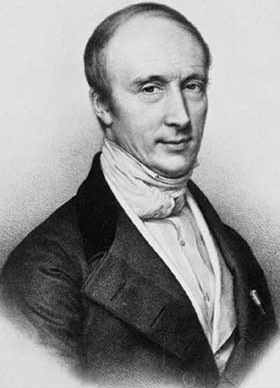 Augustin-Louis Cauchy (Paris, August 21, 1789 – Sceaux, May 23, 1857) was one of the most prominent mathematicians of the first half of the nineteenth century. He was the first to give a rigorous basis to the concept of limit. His criterion for the convergence of sequences defines sequences that are now known as Cauchy sequences. This notion has led to the fundamental mathematical concept of a complete metric space. The Cauchy condition for the convergence of series can be found in any present-day textbook on calculus. Probably Cauchy is most famous for his single-handed development of complex function theory, with Cauchy's residue theorem as the fundamental result. 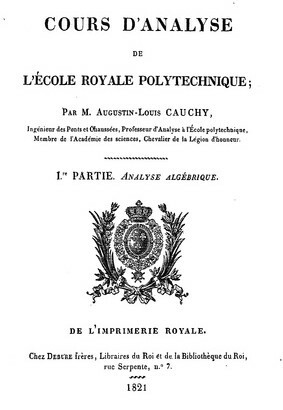 Cauchy was a prolific writer; he wrote approximately eight hundred research articles and five complete textbooks. He was a devout Roman Catholic, strict (Bourbon) royalist, and a close associate of the Jesuit order. Cauchy's father (Louis-François Cauchy) was a high official in the Parisian Police of the Old Régime. He lost his position because of the French Revolution (July 14, 1789) that broke out one month before Augustin-Louis was born. The Cauchy family survived the revolution and the following Reign of Terror (1794) by escaping to Arcueil, where Cauchy received his first education, from his father. After the death of Robespierre (1794), it was safe for the family to return to Paris. There Louis-François Cauchy found himself a new bureaucratic job, and quickly moved up the ranks. When Napoleon Bonaparte came to power (1799), Louis-François Cauchy was further promoted, and became Secretary-General of the Senate, working directly under Laplace (who is now better known for his work on mathematical physics). The famous mathematician Lagrange was also no stranger in the Cauchy family. On Lagrange's advice, Augustin-Louis was enrolled in the École Centrale du Panthéon, the best secondary school of Paris at that time, in the fall of 1802. Most of the curriculum consisted of classical languages; the young and ambitious Cauchy, being a brilliant student, won many prizes in Latin and Humanities. In spite of these successes, Augustin-Louis chose an engineering career, and prepared himself for the entrance examination to the École Polytechnique. In 1805 he placed second out of 293 applicants on this exam; naturally, he was admitted. One of the main purposes of this school was to give future civil and military engineers a high-level scientific and mathematical education. The school functioned under military discipline, which caused the young and pious Cauchy some problems in adapting. Nevertheless, he finished the Polytechnique in 1807, at the age of 18, and went on to the École des Ponts et Chaussées (School for Bridges and Highways). He graduated in civil engineering, with the highest honors. After finishing school in 1810, Cauchy accepted a job as a junior engineer in Cherbourg, where Napoleon intended to build a naval base. Here Augustin-Louis stayed for three years, and although he had an extremely busy managerial job, he still found time to prepare three mathematical manuscripts, which he submitted to the Première Classe (First Class) of the Institut de France. Cauchy's first two manuscripts (on polyhedra) were accepted; the third one (on directrixes of conic sections) was rejected. In September 1812, now 23 years old, after becoming ill from overwork, Cauchy returned to Paris. Another reason for his return to the capital was that he was losing his interest in his engineering job, being more and more attracted to abstract beauty of mathematics; in Paris he would have a much better chance to find a mathematics related position. Although he formally kept his engineering position, he was transferred from the payroll of the Ministry of the Marine to the Ministry of the Interior. The next three years Augustin-Louis was mainly on unpaid sick leave, and spent his time quite fruitfully, working on mathematics (on the related topics of symmetric functions, the symmetric group and the theory of higher-order algebraic equations). He attempted admission to the First Class of the Institut de France, but failed on three different occasions between 1813 and 1815. In 1815 Napoleon was defeated at Waterloo, and the newly installed Bourbon king Louis XVIII (a brother of the beheaded Louis XVI) took the restoration in hand. The Académie des Sciences was re-established in March 1816; Lazare Carnot and Gaspard Monge were removed from this Academy for political reasons, and the king appointed Cauchy to take the place of one of them. The reaction by Cauchy's peers was harsh; they considered his acceptance of membership of the Academy an outrage, and Cauchy thereby created many enemies in scientific circles. In November 1815, Louis Poinsot, who was an associate professor at the École Polytechnique, asked to be exempted from his teaching duties because of health reasons. Cauchy was by then a rising mathematical star, who certainly merited a professorship. One of his great successes at that time was the proof of Fermat's polygonal number theorem. However, the fact that Cauchy was known to be very loyal to the Bourbons, doubtless also helped him in becoming the successor of Poinsot. He finally quit his engineering job, and received a one-year contract for teaching mathematics to second-year students of the École Polytechnique. In 1816, this Bonapartist, non-religious school was reorganized, and several liberal professors were fired; the reactionary Cauchy was promoted to full professor. When Cauchy was twenty eight years old, he was still living with his parents. His father found it high time for his son to marry; he found him a suitable bride, Aloïse de Bure, five years his junior. They were married on April 4, 1818, with great Roman Catholic pomp and ceremony, in the Church of Saint-Sulpice. In 1819 the couple's first daughter, Marie Françoise Alicia, was born, and in 1823 the second and last daughter, Marie Mathilde. It appears that Cauchy did not give an important place to his family in his life, as his work had higher priority. The oppressive political climate that lasted until 1830 suited Cauchy perfectly. In 1824 Louis XVIII died, and was succeeded by his even more reactionary brother Charles X. During these years Cauchy was highly productive, and published one important mathematical treatise after another. He received cross appointments at the Collège de France, and the Faculté des Sciences of the University. In July 1830 France underwent another revolution. Charles X fled the country, and was succeeded by the non-Bourbon king Louis-Philippe (of the house of Orléans). Riots, in which uniformed students of the École Polytechnique took an active part, raged close to Cauchy's home in Paris. These events marked a turning point in Cauchy's life, and a break in his mathematical productivity. Cauchy, shaken by the fall of the government, and moved by a deep hatred of the liberals who were taking power, left Paris to go abroad, leaving his family behind. He spent a short time in Switzerland, where he had to decide whether he would swear a required oath of allegiance to the new regime. He refused to do this, and consequently lost all his positions in Paris, except his membership of the Academy, for which an oath was not required. In 1831 Cauchy went to the Italian city of Turin, and after some time there, he accepted an offer from the King of Sardinia (who ruled Turin and the surrounding Piedmont region) for a chair of theoretical physics, which was created especially for him. He taught in Turin during 1832-1833. In August 1833 Cauchy left Turin for Prague, to become the science tutor of the thirteen year old Duke of Bordeaux Henri d'Artois (1820-1883), the exiled Crown Prince and grandson of Charles X. As a professor of the École Polytechnique, Cauchy had been a notoriously bad lecturer, assuming levels of understanding that only a few of his best students could reach, and cramming his allotted time with much too much material. The young Duke had neither taste nor talent for either mathematics or science, so student and teacher were a perfect mismatch. Although Cauchy took his mission very seriously, he did this with great clumsiness, and with surprising lack of authority over the Duke. During his civil engineering days, Cauchy once had been briefly in charge of repairing a few of the Parisian sewers, and he made the mistake of telling his pupil this; with great malice, the young Duke went about saying that Mister Cauchy started his career in the sewers of Paris. His role as tutor lasted until the Duke became eighteen years old, in September 1838. Cauchy did hardly any research during those five years, while the Duke acquired a life-long dislike of mathematics. The only good that came out of this episode was Cauchy's promotion to Baron, a title that Cauchy set great store by. In 1834, his wife and two daughters moved to Prague, and Cauchy was finally reunited with his family, after four years of exile. In August 1839 a vacancy appeared in the Bureau des Longitudes. This Bureau had some resemblance to the Academy; for instance, it had the right to co-opt its members. Further, it was believed that members of the Bureau could "forget" about the oath of allegiance, although formally, unlike the Academicians, they were obliged to take it. The Bureau des Longitudes was an organization founded in 1795 to solve the problem of determining position on sea - mainly the longitudinal coordinate, since latitude is easily determined from the position of the sun. Since it was thought that position on sea was best determined by astronomical observations, the Bureau had developed into an organization resembling an academy of astronomical sciences. In November 1839 Cauchy was elected to the Bureau, and discovered immediately that the matter of the oath was not so easily dispensed with. Without his oath, the king refused to approve his election. For four years Cauchy was in the absurd position of being elected, but not being approved; hence, he was not a formal member of the Bureau, did not receive payment, could not participate in meetings, and could not submit papers. Still Cauchy refused to take any oaths; however, he did feel loyal enough to direct his research to celestial mechanics. In 1840, he presented a dozen papers on this topic to the Academy. The absurd membership of the Bureau lasted until the end of 1843, when Cauchy was finally replaced by Poinsot. All through the nineteenth century the French educational system struggled with the separation of Church and State. The Catholic Church strived for freedom of education (that is, the right to establish Catholic schools); the Church found in Cauchy a staunch and illustrious ally in this struggle. He lent his prestige and knowledge to the École Normale Écclésiastique, a school in Paris run by Jesuits, for training teachers for their colleges. He also took part in the founding of the Institut Catholique. The purpose of this institute was to counter the effects of the absence of Catholic university education in France. These activities did not make Cauchy popular with his colleagues who, on the whole, supported the Enlightenment ideals of the French Revolution. When a chair of mathematics became vacant at the Collège de France in 1843, Cauchy applied for it, but got just three out of forty five votes. The year 1848 was the year of revolution all over Europe; revolutions broke out in numerous countries, beginning in France. King Louis-Philippe, fearful of sharing the fate of Louis XVI, fled to England. The oath of allegiance was abolished, and the road to an academic appointment was finally clear for Cauchy. On March 1, 1849, he was reinstated at the Faculté de Sciences, as a professor of mathematical astronomy. After political turmoil all through 1848, France chose to become a Republic, under the Presidency of Louis Napoleon Bonaparte, nephew of Napoleon Bonaparte, and son of Napoleon's brother, who had been installed as the first king of Holland. Soon (early 1852) the President became the Emperor of France, and took the name Napoleon III. Not unexpectedly, the idea came up in bureaucratic circles that it would be useful to require a loyalty oath from all state functionaries, including university professors. Not always does history repeat itself, however, because this time a cabinet minister was able to convince the Emperor to exempt Cauchy from the oath. Cauchy remained a professor at the University until his death at the age of sixty seven. He received the Last Sacraments and died at 4 a.m. during the night of May 23, 1857. Cauchy was very productive, in number of papers second only to Leonhard Euler. His collected works fill twenty-seven volumes and embrace all branches of mathematics. In mechanics he wrote important works on the equilibrium of rods and elastic membranes and on waves in elastic media. He introduced a 3 × 3 symmetric matrix of numbers that is now known as the Cauchy stress tensor. In 1816 he won the Grand Prix of the French Academy of Sciences for his work on waves. In the theory of light he worked on Fresnel's wave theory and on the dispersion and polarization of light. He advanced the theory of determinants, contributed basic theorems in ordinary and partial differential equations and was the first to stress the importance of rigor in analysis. However, Cauchy is most famous for his single-handed development of complex function theory. We will sketch its development and for the sake of simplicity we present here only the very basic versions of the theorems. For more mathematical details see Cauchy's integral formula and residue theorem. where f(z) is a complex-valued function analytic on and within the non-self-intersecting closed curve C (contour) lying in the complex plane. The contour integral is taken along the contour C. The rudiments of this theorem can already be found in a paper that the twenty-four year old Cauchy presented to the Académie des Sciences (then still called "First Class of the Institute") on August 11, 1814. In full form the theorem was given in 1825. The 1825 paper is seen by many as Cauchy's most important contribution to mathematics. In 1826 Cauchy gave a formal definition of a residue of a function, which is one of the central concepts in complex function theory. Title page of textbook by Cauchy. where the sum is over all the n poles of f(z) on and within the contour C. These results of Cauchy's still form the core of complex function theory as it is taught today to physicists and electrical engineers. For quite some time, contemporaries of Cauchy ignored his theory, believing it to be too complicated. Only in the 1840s the theory started to get response, with Pierre-Alphonse Laurent being the first mathematician, besides Cauchy, making a substantial contribution (his Laurent series published in 1843). In addition to his work on complex functions, Cauchy was the first to make a rigorous study of the conditions for convergence of infinite series. He wrote a textbook (see the illustration) for his students at the École Polytechnique in which he developed the basic theorems of mathematical analysis as rigorously as possible. In this book he gave the necessary and sufficient condition for the existence of a limit in the form that is still taught. Also Cauchy's well-known test for absolute convergence stems from this book. In 1829 he defined for the first time a complex function of a complex variable in another textbook. Cauchy's collected works have been published in twenty-seven large volumes. It took almost a century to collect all his writings. ↑ Cauchy, Mémoire sur les rapports qui existent entre le calcul des Résidus et le calcul des Limites, et sur les avantages qu'offrent ces deux calculs dans la résolution des équations algébriques ou transcendantes [Memorandum on the connections that exist between the residue calculus and the limit calculus, and on the advantages that these two calculi offer in solving algebraic and transcendental equations], presented to the Academy of Sciences of Turin, November 27, 1831. This page was last modified 17:52, 24 August 2013.